Presently, A&L Foods serves the East Coast with our fleet of temperature controlled trucks. There are daily deliveries to the Baltimore/Washington, Philadelphia and New York metro areas. 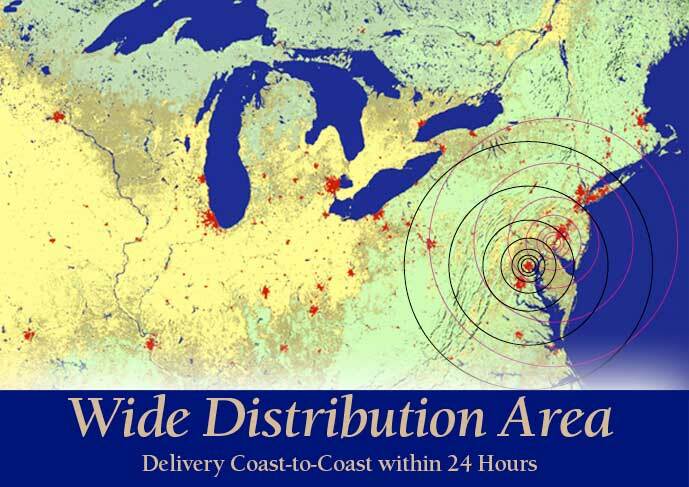 In addition, A&L regularly delivers to central Pennsylvania and the Richmond/Norfolk, Virginia markets. Also, there are weekly scheduled deliveries in Connecticut and the Boston metro areas. Deliveries outside of these areas are easily accommodated. From New York to Florida to Texas to California, A&L presently ships product, via common carrier and our company trucks, to over twenty states across the United States. For over seventy years, A&L Foods prides themselves on the service they provide for their customers. Weekend special deliveries, next day or same day service, have become normal occurrences that A&L Foods' customers have grown to expect and appreciate. A&L has the ability to deliver for you.